This is my 1st baby shower cake. My friend asked me to make this cake for her cousin who gave birth to a baby girl. This is a 3D cake that I baked a 10" square and 4"x10" rectangle cake. I cut the rectangle cake into 1/3 and 2/3 length, then I shaped the 1/3 portion to a half oval shape and stood it up for the bed head. 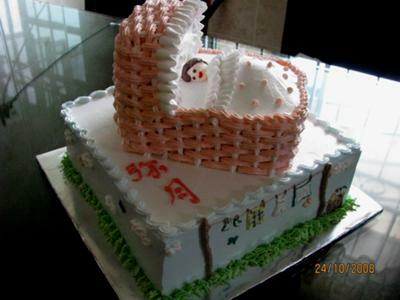 I filled the whole cake with fresh cream and pumped basket weaving around the bed.